After the Minamoto clan (the Genji) won the Gempei War against the Taira clan (the Heike), Akushichibyōe Kagekiyo, a Heike warrior who was once renowned for his bravery, became blind and was banished to the province of Hyūga (present-day Miyazaki prefecture). 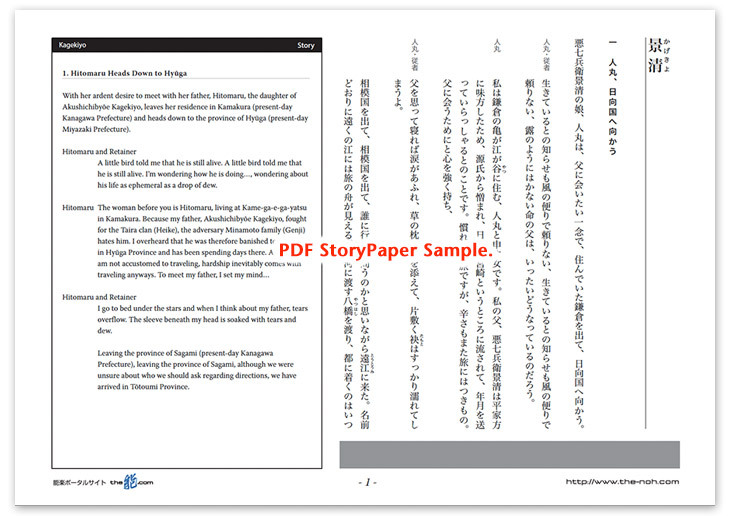 He has a daughter, Hitomaru, born from a prostitute of Atsuta in Owari Province. Although the daughter lives in Kamakura, she visits him with her retainer in Miyazaki in Hyūga Province, as she heard a rumor that her father was still alive. Just as Kagekiyo laments his miserable circumstances, Hitomaru and her retainer arrive. Although the retainer asks him whether he knows the whereabouts of Kagekiyo, Kagekiyo pretends he does not know, trying not to indicate that he is Kagekiyo himself. He insists that because he is blind, he has never seen the man. After that, Hitomaru meets a villager and is told about her father’s situation. Thanks to the villager’s help, she is finally able to meet with her father. Kagekiyo then responds to her requests and narrates the story of the battle at Yashima. It is the great battle scene which he fought against Mionoya no Shirō of the Genji, pulling Mionoya’s neck protector, the shikoro*. When he finishes the story, Kagekiyo tells his daughter that his life will soon end and he asks her to console his soul after his death. Then the father and the daughter separate again. *Shikoro: a neck protector which hung closely from a warrior’s kabuto helmet. The character “aku (悪)” in the name Akushichibyōe does not mean “bad” but “strong.” He was distinguished by his outstanding gallantry among the warriors of the Heike. This is a masterpiece which gently describes a pitiful aspect of human life through the life of a once great warrior, who lost battles and became a ragtag. It also narrates a deep love of human beings through the daughter who, rushes across a long distance, in her ardent desire to meet her father despite having been separated from him. This is one of the most difficult pieces that requires excellent expressive power among the actors. 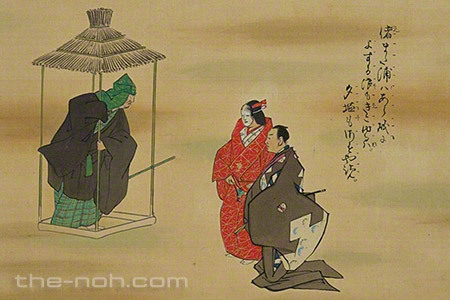 The scene where the shite starts to recite “Alone closing the pine gate” in a straw hut is known as the “shōmon no utai (chant of the pine gate).” It has a unique melody and is extremely difficult to perform, which creates a vocal highlight that the audience can fully enjoy. Each Noh school has own interpretation of this drama and expressions of Kagekiyo. One school describes him as a totally reduced man who gave up his past honors, while the other describes him as a man with a hint of knighthood and grittiness. Also, the special mask “Kagekiyo,” exclusively used for this piece, varies school by school. Please thoroughly enjoy this masterpiece that richly presents us the deepness of our life.